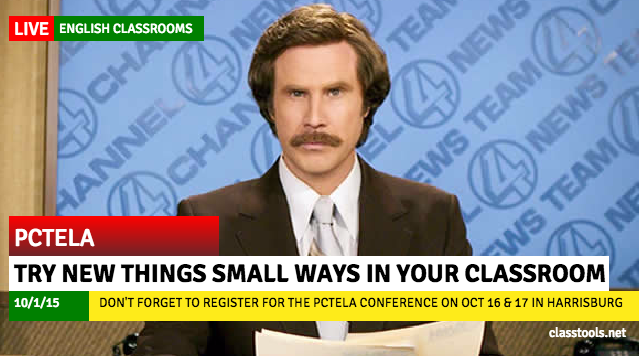 This was my first time attending a PCTELA conference, and it did not disappoint. I’ve been fortunate enough to be able to attend larger conferences—NCTE last November and ISTE last July—and as wonderful as those conferences were, I found that I really appreciated the quiet, more intimate feel of last weekend’s PCTELA gathering. In place of harried running from one side of a convention center to another were, instead, unhurried conversations over lunch and friendly roundtable talks with old friends and new. 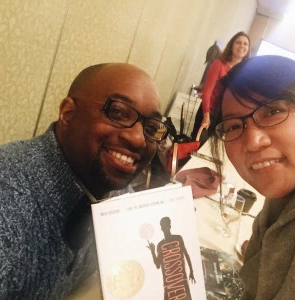 I had a chance to talk books with Nerdy Book Club blogger Cindy Minnich and even take a selfie with Newberry author Kwame Alexander. In particular, I enjoyed how Lynne and Diane showed us the power of the “whispering parentheses.” For example, during their presentation, they pointed us to the wonderful uses of parentheses in Cynthia Rylant’s An Angel for Solomon. I also appreciated their mini-lesson on creating paragraph breaks. After discussing when a writer might use a paragraph break―for example, when there is a change of topic, location, time, or speaker―Lynne and Diane then shared a short excerpt from Jo Bannatyne-Cugnet’s A Prairie Year without any paragraph breaks. Together, the teachers in their audience became students as we discussed where to place the breaks. Though a brief session, Lynne and Diane’s workshop offered many practical lessons I can use in my classroom today. Here’s a quick tech tip for Thursday. This summer I discovered the Pinterest Button for Chrome, which allows you to organize pictures and websites on different boards (subjects) for later perusal. I’ve really appreciated having this to snag something and place it somewhere out of the way until I’m ready to peruse it. Need to spice up your classroom activities? Try asking students to do infographics. Here’s one my students came up with: an Emojicoaster. Have them track how they feel about a book based on events as they’re reading. This alternative to a timeline of events helps them process how they feel and helps you see what they’re thinking. Today a colleague shared this “Breaking News” generator and I suddenly had 20 different ideas of how to use it in the classroom (goofy example below). This reminded me that experimentation and change doesn’t have to be huge or profound–we can use small things to re-see what we do every day in the classroom.